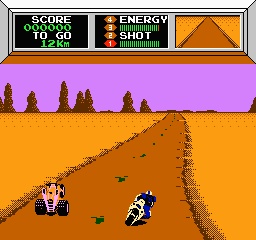 Mach Rider is a vehicular combat-racing game that was part of the NES Black Box series. In the year 2112, Earth has been invaded by evil forces and it's your job to rescue all survivors. The modes on offer are Fighting (split into ten sectors where you must reach the checkpoint before time expires and without running out of energy), Endurance (reach certain distances before time expires), Solo (similar to Endurance, but with no enemies) and Design (create your own courses). The A button accelerates, while B fires your machine gun that can destroy enemy vehicles and some roadside objects; however, rocks and balls are immune to bullets so they must be dodged. With driving being a key component, the poor implementation is puzzling and most of your time will be spent swerving like a madman in an attempt to avoid crashing for the millionth time. Cornering is the worst offender due to the dodgy side-camera angles that don't follow the road on bends (stopping you from seeing what's actually in front of you). This results in non-stop blind corners and tons of unavoidable collisions where rocks appear from nowhere. The obvious thing would be to slow down, but fellow riders are constantly on your heels and will destroy your bike if you move out of top gear. What follows is some aggravating and unfair gameplay that favours dumb luck over twitch-based skill. The choppy frame-rate doesn't help matters either and trying to make precise movements is nigh-on impossible. It's disappointing as the core concept is appealing and some of the ideas (e.g. the cool rear view camera) are cutting edge. The ability to create your own courses is great, but again the dire gameplay makes it a moot point. Mach Rider is an innovative title that tries to combine several genres, but shamefully fails to master even a single one of them. The controls, racing and combat are littered with rampant programming issues and the feeling of never being in control is tough to ignore in a game that requires razor-sharp accuracy. Random trivia: The game was later re-released on the Virtual Console for the Wii (2007), 3DS (2013) and Wii U (2014).